I was accidently adopt a bunny… how come? So my brother calls me up one day and tells me he is moving back to Calgary, Alberta. And he wants me to take his bunny because he couldn't think of anyone else that he trusts her enough with. First thing going through my head is "what, but she doesn’t like me." Spaz has never liked anyone but my brother. August 4th was suppose to be move in day. But of course he calls me like a week and a half early and asks if I can take her sooner. So I call around to see who isn't busy and can help me get her from his place to mine. For a bunny who has always hated her auntie, she cuddled with me the whole way to my place and when we got home I got help setting her cage up so I could cuddle with her some more. As soon as her cage was set up I placed her in her cage, filled up her water and food dishes, and all she wanted to do was run around my apartment. I would follow her around all day to make sure she wasn't getting into trouble. The only bit of trouble was with the cat. The cat decided that she was a giant mouse, so he would follow her around too and when he tried to bite her all he got was a mouth full of bunny fur. But it has now been 3 months and the 2 of them are getting along like siblings. Spazzy has a new hiding place since we rearranged our bedroom. 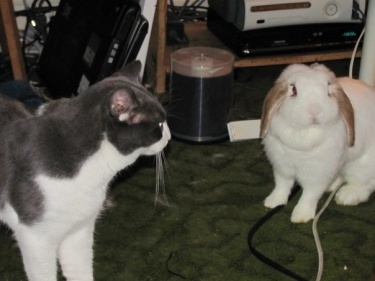 Hugo the cat & Spazzy the bunny playing hide and seek. The first time I seen them act like siblings was when they were playing hide and seek. The cat somehow got on top of the fridge and Spaz was looking around and knew that he was in the kitchen but couldn't find him and she got sad so she came and cuddled with me on the couch. I love her so much and I love giving her all my attention, and I think February is going to be a big change for all of us. We are welcoming the first baby into the family. I do not want either of the animals to feel left out and that I don't love them.